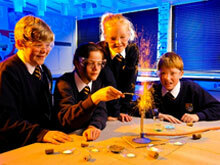 The Key Stage 3 course has been developed in-house to reflect changes in Science at all Key Stages. It is based on the Activate Science series. Each topic is built around real-world themes and issues in order to highlight the relevance of science to our everyday lives. The scheme uses a wide range of multimedia resources and activities which allows lessons to be tailored to meet the range of learning styles and abilities of each class of students. All classes at Key Stage 3 are taught in mixed ability form groups. At the beginning of Year 9 students start to study GCSE level courses. Most students follow AQA Trilogy science route through Key Stage 4, which leads to two GCSE grades for science. 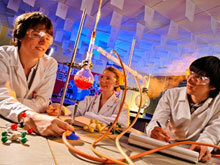 It is a combined course which has Biology, Chemistry and Physics elements. Students who particularly enjoy Science can opt for Separate Sciences (3 Science GSCEs) during the Year 9 options process. Uptake for the separate sciences has been strong since its introduction here in September 2008. Students are set according to ability for their GCSE courses. All examinations for Science are now at the end of each course. Practical work is carried out throughout the course and will be tested in the written papers at the end of the course from 2018. 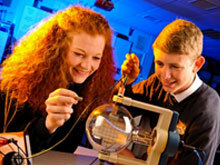 Science is involved in the STEM club (KS3); GCSE revision; Physics, Chemistry and Biology clubs as well as running various visits, external trips and residential courses both here and abroad.